Faith Freedom International • View topic - Meccan, Medinan or Muddled? Skynightblaze suggested a thread about the division of verses between Meccan and Medina after I’d said there had been claims – not well expressed – that the division was spurious. I suggested that this was part of a larger question, such as whether the Koran even emanated from Mecca, let alone came from a Mohammed as described in Islamic tradition. My concerns sprang from recent readings on or linked from the site of inarah.net of or about work by a variety of authors including Christoph Luxenberg and Ibn Waraq and claims that the material in the Koran was derived from a pre-Muslim Christian lectionary. You can see where I’m coming from! Having thought about it, I think it would be best to stick to the Meccan-Medinan question so here goes. I’ve always thought it odd that the Koran chapters were assembled in order of length, which immediately makes you think they might not be closely related. That they were said to be gathered from fragments written on various materials and assembled in that way suggests that those assembling them had no idea how they were related either and certainly were not aware of any chronology by which they could be arranged. That aside, when I heard that there were said to be Mecca and Medinan chapters I took on the impression that a chronology could be divined from such as the points in Mohammed’s life – e.g. fancying a new wife - at which it suited him to have a particular revelation. I further assumed that from this that, not only could they be ranked by date but that, surely, many of these events could be identified to within a year or two. Yet I could never find a listing of these likely dates. However, much has been made of how the Meccan verses (oh, did I mention that someone claimed that even verses within a chapter could have quite different dates?) were peaceful while Mohammed was on sufferance in Mecca but turned nasty once he became a Medinan warlord. Which was where things were before I found inarah.net and read an article that implied that the verses were in fact classified by whether they were peaceful or warlike and ascribed to Mecca or Medina on that basis, not by some derived chronology. Detection of violent phrases in “Meccan” verses, claimed the author, invalidated the whole concept. Which seemed relevant to the discussion between sum and Skynightblaze about Mohammed’s threatening slaughter. Anyway, I thought the matter might have been done to death already on the forum but all I can find is a post by a rather confused me from a year ago. http://forum09.faithfreedom.org/viewtopic.php?f=21&t=16597&p=219951&hilit=meccan#p219951 which gives only a link, not details. So here goes Skynightblaze. Anyone want to join in? Firstly, I must admit that I can’t find the claim that started me off, but I’ll continue to look for it. Meanwhile, a bit of food for thought: something that cynics might think detracts rather from the classification: the classification of chapters is printed with them in most copies of the Koran! Most copies of the Qur'an have an entry at the beginning of each sura stating the name of the sura, whether it is Meccan or Medinan, and how many verses it contains. These superscriptions are not considered to be part of the revealed text, but they are fairly uniform in copies of the Qur'an. Just one example (below): the last word on the left in the gilded panel is "makkiyya," indicating a Meccan sura. There is also a whole branch of Islamic learning called asbābu t-tanzīl (أسباب التنزيل) which is concerned with determining the circumstances in which any given sura was revealed to the Prophet. Of course, there is a lot of disagreement about the details. So the answer to your question is: no, there is no universal agreement. So Muslims believe it but disagree about it. Is it worth going on? Re: Meccan, Medinan or Muddled? Well, as none of the texts in the Qur'an start with a date or a place , there is always room for debate on this. This is based on relating events in Mohammed's life, as recorded by other writers, to the words in the surah. Some of the ordering is also simply based on tradition, as found in hadith. Muslims generally do not accept that texts have been revisited and later amended or added to, even though certainly some surahs, specially the 2 second one and others too, have signs of that. What is quite noticeable though,is that the message of the Qur'an gets considerably more violent in the surahs assigned to Medina. It is as if we in fact face two different versions of Islam in the Qur'an. As to sources for the Qur'an, we can say that much comes from biblical texts, but is generally modified somewhat, but there also other sources, Greek classical folk tales, for example, and ideas from Sabaean and Hindu traditions. For example the notion of the jinn is something from Southern Arabic folk traditions, and the buraq has a parallel in Hindu tales. What has also found its way in the Qur'an are fragments from non-canonical writings from Christian and Jewish tradition, i.e. later stories, not included in the bible. The talking infant Jesus in one such thing, or the crows in connection with Cain and Abel. I don't believe there was any SINGLE pre-Islamic that contained ALL these elements, Christian or otherwise. It is just a collection too odd and motley to be recorded in a single text twice over, and it has some distinct Arab flavour, containing Arab folklore, which would be out of place in a lectionary. Fernando wrote: Skynightblaze suggested a thread about the division of verses between Meccan and Medina after I’d said there had been claims – not well expressed – that the division was spurious. Some things from the quran surely came from Muhammad. Muhammad had special privileges with regards to women and many things. It becomes painfully obvious that these verses were written to serve Muhammad and nobody else. If the quran did not come from Muhammad then what purpose do these verses serve? Take for e.g the verse from quran which tells muslims that after lunch they should not chat at Muhammad's house and they should leave and not annoy him. What benefit can a person who is fabricating such verses get out of them? It would make sense only if Muhammad was the one who was claiming to receive such revelations. Now let us assume that quran did not come from Mecca.For this theory to make sense following question needs to be answered: Why would the fabricators choose a barren land such as Mecca as their base of faith and not the land where quran was supposedly produced? What benefit would they get in doing that? Fernando wrote: My concerns sprang from recent readings on or linked from the site of inarah.net of or about work by a variety of authors including Christoph Luxenberg and Ibn Waraq and claims that the material in the Koran was derived from a pre-Muslim Christian lectionary. Manfred elaborated it better in his reply.Why would quran contain pagan/jewish etc etc rituals if it came from a christian lectionary? Fernando wrote: . Detection of violent phrases in “Meccan” verses, claimed the author, invalidated the whole concept. Which seemed relevant to the discussion between sum and Skynightblaze about Mohammed’s threatening slaughter. Compilers of quran may have goofed up some things here and there. I am pretty sure that the classification has human errors because its practically not possible to recollect 20 years after muhammad's death as to which place the verses were revealed. This could be because of human error and not necessarily due to attempt at fabrication. Infact the whole confusion and goof up leads me to believe that the fabrication idea seems less likely. A fabricator would be more organized because he has concrete intention and would not display so much of confusion and mess. I am not saying that fabricators cannot goof up. All I am saying is the chance of them goofing up would be low as compared to chances of someone genuinely trying to sort scattered pieces of quran with the intention of making it a book . We can visualize some practical problems faced by early muslims as mentioned by islamic historians in the islamic tradition. They appear genuine and practical in nature. Starting from Manfred's explanation, we have to divide the Koran into at least three parts - all intermingled. First we have the old stories from elsewhere, which I'll call "padding", then we have the revelation that specifically help Mohammed, which I'll call "wish fulfillment" and only then do we get to the crux of the matter, religion, which is what it's supposed to be about and which I'll call "Allah says". It would seem to me that only the "wish fulfillment" section would vary according to Mohammed's circumstances. It may be better to sort the chapters and verses according to such a scheme but I personally couldn't even scratch at the surface. As for how some of the older stuff got in there, I still haven't had time to go back over my sources but the arguments about a lectionary seem to stem from the absence of diacritical marks. The author claimed that they were in use at the time but the rasm was used as a shorthand reminder for... recitation. The other strand to the argument is that the Arabs associated with Nazareans - something like Messianic Jews - which is where a lot of the Christian and Jewish stuff came from and would explain the apocryphal element. These proto-Muslims fell out with the Nazarenes and felt the need for their own Holy Book and naturally assimilated a lot of the Nazarene stuff. A gross oversimplification, perhaps not fully understood - but that seems to be what the Koran is anyway! I'll try to put some flesh on those bones, or at least gather some links. Meanwhile, just a snippet. The History of Religions can no longer remain ignorant of the recent developments in Qumranic Studies. Denying the presence of a monastic sect close to the Dead Sea, these new developments, relying on a vast array of data from archeology, exegesis, and Islamology, have brought to light a far greater history of the messianic movement. While the latter’s origins predate our era (as preliminary), the ideological construct of salvation it is finally predicated upon began to form and spread following the destruction of the Jerusalem Temple in AD 70. A path of research opened up a long time ago, yet left underexploited until recently, reveals a variety of critically significant common features between this movement, comprising many groups of self-designated “Nazareans” (or “Nazarenes”), and the so-called Proto-Muslims. Up until the 8th Century, the latter designated themselves under the name of “Immigrated” or muhâjirûn – i.e. those who made the new Exodus. The denomination muslimûn, though Koranic, appeared later (its original meaning, so far as the prime Koranic text is concerned, is not the same). Sorry if I seem to be wandering off the topic of my own thread but I fancy any Meccan-Medinan argument only makes sense in terms of any particular view of the origins of the Koran and hence of Islam. A rather tall order! And here is the article about diacritics. By contrast, the following document posted here on the Internet (Perf 558) attests the authentic use of diacritics; it can be seen in Vienna, at the National Museum of Austria. The manuscript is a bilingual Greek Arabic manuscript dating back to the year 642. This manuscript shows diacritical signs on the letters. It is one of the oldest Arabic manuscripts (the other one is the P. Berol. 15002 – as far as early engravings, there are the bilingual ones found on the lintels of the churches of Zabad and Harran in Syria). What is more, this document confirms the title of muhajirun (those who completed the Hegira – transposed in Greek as magaritaï ) by which the proto-Muslims were designated (until about 720). So I suppose this chap would want to know: which of the "leaflets" were from Meccan or Medinan Nazarenes. Or would he? and has a map which I've mentioned before, claiming that the Koranic writing must have originated well North of Medina. Here at last is the Mecca-Medina article. It's from the same source as the ones above but as I'd read them at different times the fact hadn't registered! Fernando wrote: Detection of violent phrases in “Meccan” verses, claimed the author, invalidated the whole concept. Which seemed relevant to the discussion between sum and Skynightblaze about Mohammed’s threatening slaughter. Are there any violent verses revealed before 622? 2.256 No coercion in religion was revealed in Medina (just after the battle of Badr). It seems to me that Sura 2 contains also meccan verses. I believe that the majority of violent verses were revealed after the conquest of Mecca in 630, although some violent verses were revealed after victories (Badr in 624, ditch in 627, etc.) or violent events (Qur'an 5:33). So it is wrong to say that all tolerant verses were revealed before 622 and all the violent verses after 622. In any case, the tolerant verses are abrogated by the violent verses following the verse of the abrogation. Fernando wrote: Here at last is the Mecca-Medina article. It's from the same source as the ones above but as I'd read them at different times the fact hadn't registered! Sorting Out the “Meccan” Surahs on One Side, the “Medinan” Ones on the Other? We already know that there were multiple quran as we have discovered conflicting copies of quran. 2 Muhammad theory does not seem to be supported by evidence. Just because we have conflicting versions, personal notes in contemporary editions it does not follow that there were 2 muhammad. Why cant it be a simple fact that muhammad did not standardize quran before his death and each author considered himself as the authority over quran after his death to maintain a quran that he perceived came through Muhammad's mouth? As I said previously, if there was no standardization of quran by muhammad then these kind of problems are bound to surface. Since nothing is concrete there is room for interpretation and different variants. I see this is a very natural consequence of non standardization and a very real practical problem anyone would face in such a situation. Islamic tradition documents the same. I think this article is over complicating and trying to draw conclusions even when there are no concrete reasons. Also we are assuming here that muhammad himself dictated the same thing over the period of years. What if muhammad himself told one thing to one scribe and unknowingly told something else to other scribe? Both the scribes would be right in that case. The problem could lie with muhammad contradicting himself and hence the discrepancy. Fernando wrote: It all begins with a double postulate: on the one hand, the Islamic idea that Muhammad simply dictated the Koranic text as it is; on the other, the ideological postulate according to which every “religion” necessarily begins as a “spiritual” phenomenon – to later become a “political one. Applied to Islam, this postulate of Western thought implies a classification between the surahs deemed peaceful and spiritual and alleged to have been “revealed” in Mecca, and the so-called “post-Hegira” alleged to have “come down” to Medina in a purported context of confrontations with the Meccans – and thus violent and warlike, essentially dealing with waging war and killing. 1) Why cant the quran be intended to be political document right from the start as against starting spiritual and gradually becoming political as implied by the article? 2) One possibility according to the above is - muhammad dictated the quranic text as it is. This possibility is actually out of window especially when we finding conflicting versions of quran. Why can't it be that partial quran came from muhammad as it is and partially came from what scribes believed to be coming from muhammad? Also the article speaks as if its very unnatural of meccans to fight with muhammad considering the fact that muhammad wanted to subjugate the entire arabs to islam. Conflict is inevitable in such a case and hence that's a very natural and obvious explanation to war like surahs. Also I am pretty sure that this classification is not accurate as it claims. 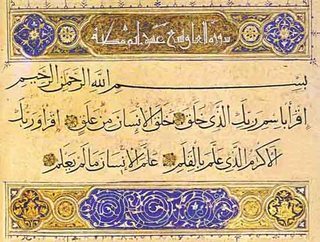 Zayd Thabit was just born when quran was first revealed i.e. in 610 Ad. Now the current day quran was assembled in 652-653 AD as the tradition claims. Are we to believe that Zayd or any other hand who compiled current day quran remembered exactly the place in which a particular verse was revealed? As per tradition , they did not even remember the verses let alone the place where it was revealed. In such a context, its impossible to get the classification right 100%. The above argument is actually trying to support the theory islam prescribes peace and it has coherent and global vision. Looks like the author has a good sense of humor. . I can write a better book in 2-3 months let alone 23 years that quran took. A simple fact escapes most of the apologists - We don't need every single verse in the quran to be violent to be labelled as violent. In case of quran, violent verses outweigh the peaceful ones and hence quran becomes violent. Infact 1 unjustified call to murder or actual murder seals the deal. Imagine a murderer giving an argument in the court in self defense that he murdered only one person and the rest of the life he was peaceful and hence he is not violent. I have often wondered when the various Korans were written. If they were starting to be written when Muhammad was alive, why did Muhammad not get wind of this? Did Allah not know that this was happening? If Allah did know then he said nothing to Muhammad. Muhammad`s final illness, as far as I can make out, was a lengthy process apart from the very end. One would have assumed that Muhammad, realising that his time was almost up, would have had the Koran, with its final guidance for mankind, uppermost in his mind and made sure that it was written correctly. It appears that Muhammad never gave this a second thought. If he had endorsed a properly written Koran then there would not have been any variations. Why on earth did Muhammad not see to this? Why did Allah allow this to happen? Did Allah endorse the final version chosen out of all the variations? As far as I know there is no reference to this. If this is the case then the final guidance for mankind was left n the hands of man. I totally believe that in his final days Muhammad lost all interest in the Koran as it had served his purpose and was now of no further use to him. There also appears to be no final message from Allah. No "signing off" and no indication of what was going to happen to Muhammad after his death. Very strange and a very unsatisfactory end to the beginning of Islam. To me, the end days of Muhamad go a long way to confirming that his "religion" of Islam was a falsehood from the very start. I don't think muhammad would have been able to collect the quran word to word even if he took such a task before his death as it was too late and the damage was already done i.e. a lot of quran was not on the written record. Some of the quran was written but it was not available in single piece i.e it was written on bones, parchments, leaves , camel hides etc which were scattered. There are some ahadith which say that during that battle of yamana a lot of memorizers of quran died and as a result the quran was lost. This means not all the quran was recorded. Now the problem was - After a period of 23 years ,no one was going to remember what was said and that includes muhammad himself. There are certain ahadith which testify to the fact that muhammad himself used to forget verses from quran. Ideally the task of collection of quran should have been taken care right from day 1 i.e. when muhammad received first revelations. But I don't think muhammad was smart enough to understand this. Now this proves as you said that Muhammad's religion was a scam right from the beginning. He only wanted attention and needed quran to get what he wanted. If he was serious about guiding mankind and had come with true message from God, the first thing he would do is standardization and have everything in writing right from day 1. Tall claims such as messenger of God for entire mankind come with a responsibility. He made such claims but he was not capable of even understanding this let alone fulfilling the responsibility. We got to remember that we are talking about a desert thug with low IQ and efficiency. What can we expect from such an illiterate scum? The filing system for the stones, leaves, shoulder blades etc must have been utter chaos. I can not imagine that all the verses were recorded on these as there would be no method of keeping them in order or even room for them all. The "revelations" in the Koran must have at some point relied on the memory of the muslims but as has already been pointed out many of those who had memorised a lot of the Koran were killed in battle. Even ahadith admit that parts of the Koran went missing. Where was Allah in all this? Muhammad did not seem to care about the accurate and sequential recording of the "revelations". How could Allah care when his creator - Muhammad - did not care? Muhammad had admitted that he did at times forget the "revelations" and so one would have thought that he would have insisted on them being recorded in writing so that both he and his followers had a validated source to which they could refer. On what basis was the final version of the Koran deemed to be correct? Was there any comment on how to cope with the alleged missing verses, especially those referring to stoning? If the Koran did not mention stoning as a punishment then are we to assume that the ahadith referring to missing verses are false? sum wrote: Where was Allah in all this? Muhammad did not seem to care about the accurate and sequential recording of the "revelations". How could Allah care when his creator - Muhammad - did not care? Indeed, Allah evidently didn't care a jot, since he is alleged to have the original 1st edition permanently stored on a "preserved tablet". Surely one of his many supernatural minions could have knocked-off a fair copy in no time at all (probably literally). And probably got the chapters and verses in the right order, too!